Kim Cameron opened the invitation her 4-year-old daughter received and was instantly shocked. “The invitation was very elaborate,” the Fort Worth mom reveals. “It was professionally printed on thick cardstock and included a little watercolor paint palette.” But it also included a registry of pricey birthday gift wishes. My, how things have changed since Cameron, whose name was changed for privacy, and the rest of us moms were kids. And gift registries aren’t the only tricky issue modern parents find themselves faced with. So we consulted the experts — Park Cities etiquette expert Elise “Mrs. Manners” McVeigh; Misty Harris, owner and director of Texas Etiquette in Fort Worth; and Dallas lifestyle expert, author and Southern Living editor-at-large Kimberly Schlegel Whitman — to help you navigate challenging party situations one invite at a time. Who has to get an invite? It’s the question etiquette experts get asked the most: Do I have to invite my daughter’s entire class? The answer is no. Harris says the costs and logistics of inviting 25-plus kids (plus parents in some cases) gets out of control quickly. “I like to keep it simple,” she explains. “The number of invited guests is equal to the child’s age.” So your 5-year-old gets to invite his five closest friends. “It allows you to do something really special,” adds Harris, who treated her 7-year-old to a Breakfast at Tiffany’s-themed birthday recently. Eight little girls got to personalize pearl necklaces and bracelets, make sleep masks and get pampered. What’s the proper way to handle requests to bring siblings? Whitman advises enlisting the venue’s staff to help handle unexpected extra guests. “A host can delicately refer the parent of the sibling to the [front] desk and say something like ‘I have Carol registered to participate already but you can sign Cheryl up [over there],’” she says. That way, the staff handles that uncomfortable conversation of asking parents to pay for the extra kiddos they brought. Can you give an RSVP nudge? Brittany Harmon loves throwing parties for her three children — ages 16 months to 9 years — but she says she hates that no one abides by the RSVP-by date. “It makes it hard to plan,” the Flower Mound mom laments. Is it OK to request gifts? Registries and wish lists like the one Cameron’s daughter received should only be shared with out-of-town family like grandparents, aunts and uncles who may not know what your child likes, McVeigh explains. “A party is a get-together with friends and a gift should never be expected,” she adds. It’s fine to write “No gifts, please” on the invite or to ask guests to donate to a specific charity in lieu of gifts. It’s a thoughtful way to side-step unwanted presents, McVeigh says. Plus, it provides an opportunity to teach the birthday boy about helping others. Consider collecting new books for the children’s hospital or puppy toys and treats for a local shelter, then enlist your kiddos to deliver the goods with you. Should you open gifts at the party? Experts say that this one can really go either way. If time allows, open gifts. If not, take them home. Regardless, send a thank-you note (see the sidebar for tips). “I’ve also texted photos of the darling looks on my children’s faces [when they open a gift] to the gift-givers,” Whitman says. How long can I wait to RSVP? Can I bring his brother? Pretty please? It’s inappropriate to ask if you can bring siblings. But if you’ve exhausted other arrangement options and must, Harris suggests calling the host as early as possible, apologizing and trying to find a solution that puts the least amount of burden on her. Offer to pay for the sibling separately or bring something to occupy him while his brother enjoys the party. “Bottom line: Do not let siblings disrupt the party activities,” Harris says. Rather than put a price limit on a gift, be thoughtful in its selection. Does the birthday girl love art? Get her a set of glittery markers and fancy papers. Is the birthday boy an only child? Buy him a game that is just as fun to play solo as it is to play with others. And if the invite says no presents, the polite thing to do is honor that. “You can bring a card if you worry about showing up empty handed,” McVeigh suggests. 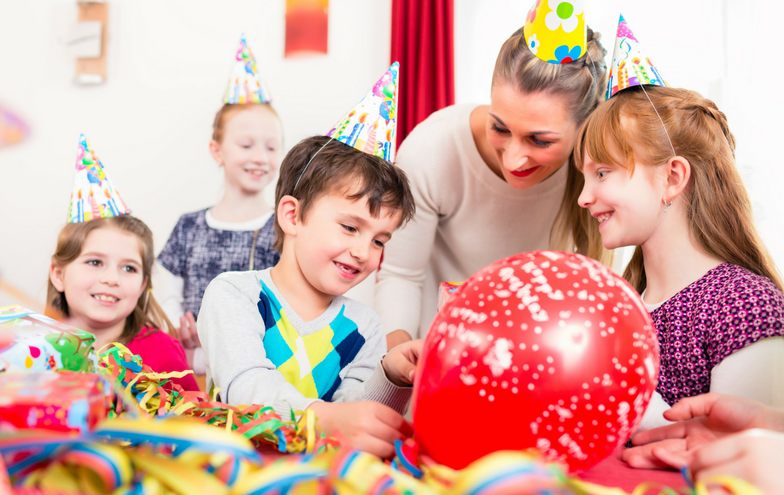 As kids get older — around kindergarten age — most kids’ parties become drop-off-and-pick-up affairs. But if you’re unsure, ask the host. And if something (anything) about a party makes you uncomfortable such as a gift registry link or an invite that requires that attendees buy something (like a costume or admission to an amusement park), decline the invitation and ask the birthday girl over for a one-on-one celebration with dinner and ice cream sundaes for dessert. This article was written by Sunday McClendon and originally appeared on DFWChild.